Founded at the beginning of the 8th century by St. Magnus, the Bishop of Oderzo, the church was dedicated to St. John the Baptist. It was restored in the 9th and the 12th centuries and rebuilt in 1475. It is held that the name derives from the old dialectal word bragolare, meaning the fishing trade, or from bragola, meaning a market square. Another tradition states that the church took its name from the Greek agorà, which means simply “square”. “Construction of the church began in the middle of the 1500s and was based on a design by Jacopo Sansovino. The front is in the Tuscan style, and above the door is St. Martin giving his mantle to the poor man (early 15th century) in a marble surround dated 1538. 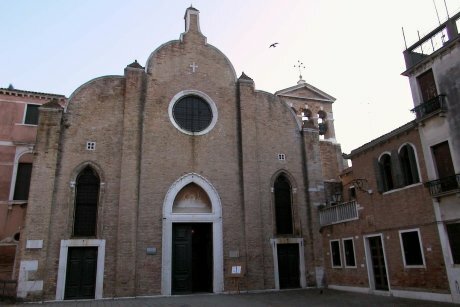 It is said that on the spot where the church now stands once stood the little church of St. Mark, where, tradition has it, on his return from Aquileia St. Mark the Evangelist greeted an angel with the words “Pax tibi Marce Evangelista meus”, which form the motto of the Republic of Venice.